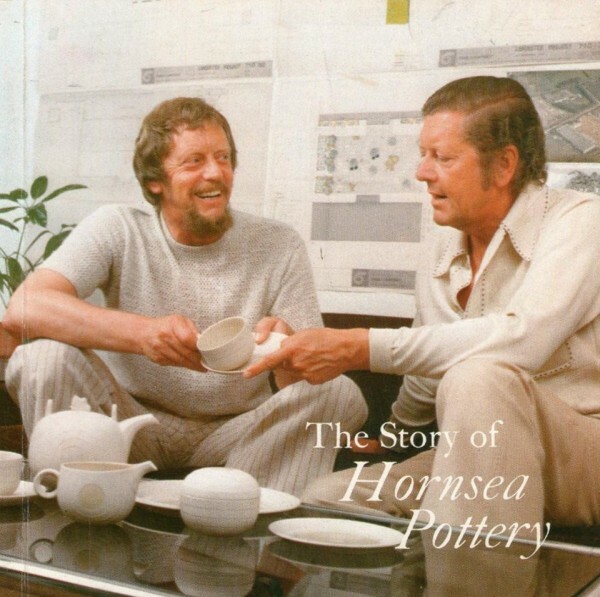 Hornsea Pottery was located in the seaside town of Hornsea on the East Yorkshire coast between Scarborough and Hull, and was founded by two brothers, Colin and Desmond Rawson in 1949. At first it operated from a small terraced house at 4 Victoria Avenue near to the sea front but, as production increased, it later moved to the Old Hall where production was in a glass topped conservatory, and also to Ulrome a small village near Hornsea. Desmond Rawson had purchased the vicarage in Ulrome and used part of the property to expand production and also to live in with his family. By mid 1954 the company employed 65 people – too many to accommodate in the Old Hall and Ulrome – and therefore another move was necessary. Edenfield Works, the site of an old pottery that made roofing tiles during the mid 19th century, was purchased. Production increased and Hornsea Pottery was supplying major retail stores in the U.K. and also exporting to many countries . By 1974 the Edenfield Works employed 250 staff and was turning out over 3 million pieces a year. A second factory was built at Wyresdale Road, Lancaster consisting of 42 acres near to the M6 motorway and was opened on 23rd May 1976 by Hornsea actor Brian Rix. New staff were recruited locally and trained in pottery production. Hornsea Pottery became one of the major producers of pottery and tableware in the U.K. The quality and innovative designs of their pieces led to Design Council awards. In 1976 the factory was visited by HRH Princess Margaret who was presented with a specially designed pair of boxed tankards depicting the Wars of the Roses on which the main characters were printed in 22 carat gold. A large proportion of the site at the Edenfield Works was gradually developed into a leisure and retail park which attracted over one million visitors a year. This park became the first acknowledged factory shopping village in the UK – now known as Hornsea Freeport. Unfortunately in April 2000 the pottery was placed in the hands of the receivers and went into liquidation with the loss of about 150 jobs. A very sad day for the pottery workers, Hornsea and Hornsea collectors everywhere. HORNSEA TOWN HALL EAST YORKSHIRE HU18 1PA WITH A.G.M.